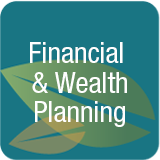 The thought of financial planning may be intimidating. Nagging questions repeat: “What if I don’t have enough money to retire? How can I set aside money today that will amount to something when I retire?” Want to avoid ending up in a nursing home? Engage a financial planner today. View financial planning like an education. Invest in yourself. Learn about costs of in-home care. Learn about care community costs. Can you afford long term care insurance? Will life insurance pay for care costs? There are as many questions as there are answers and plans. Protect your future by becoming more informed.